I'm back on vacation again but this time I'm staying home to get the kids ready for School. We do have plans however to go out to Jasper or Banff for the weekend. As we're coming to the last days of summer I thought this would be the perfect card for a end of summer party!My daughter keeps asking me if we can have a party before school begins, I think I might let her. As my daughter enjoys the last days of summer I'll be looking forward to school starting! This card is being entered into the following challenges this week. This is just way too cute!! Thanks so much for playing with us this week at Shelly's Images! Just adorable! I love the pink and yellow together. Thanks for playing along with us in Mo's Challenge this week. Wonderful card! Fabulous colouring and layout and I love all your precious details, you really make everything so special. Thanks for playing at Stamp Something, hope to see you back next week! Adorable-got to love Mo!!! Thank you for joining us this week for Twisted Thursday at Shirleys2Girls. Join us again tomorrow for a new challenge! You did a terrific job.. Thanks so much for joining us at MO's this week. Cute card! Thanks for joining us in our challenge at Shellys Images. We hope you will join us later today for a new challenge! 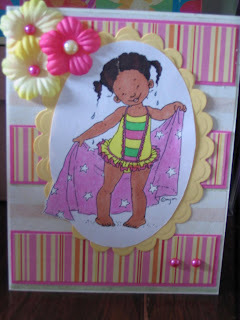 Lovely summery card, very cute!